At the northwest corner of the Sea of Galilee, two churches sit at the site where Jesus is believed to have performed the miracle of the loaves (where he fed a multitude of people) and where he appeared after his resurrection. The Church of the Multitudes was reconstructed on the site where a Byzantine Church once stood, and has been built as a replica of the original 4th century A.D. Church. Nearby, the Church of the Primacy of St. Peter was built on the site where Jesus is believed to have appeared to Peter the Apostle in his third resurrection and bestowed the primacy of the church on Peter. Capernaum is called "Kfar Nachum" in Hebrew. It sits on the western shore of the Sea of Galilee and together with the Christian sites sits the ruins of an ancient synagogue. It's importance to Christians is considerable; Christians believe that Jesus preached many of his sermons at Capernaum and much of his Ministry took place here. Also many of the miracles recounted in the Gospels took place at Capernaum. Throughout the years, various branches of Christianity have built here, and today, visitors can see St. Peter's Catholic Church, a Greek Orthodox Church and a Franciscan Monastery. 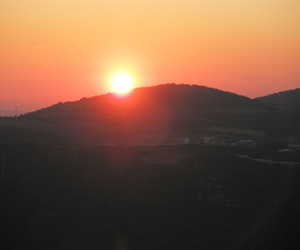 No one is certain where Jesus gave his Sermon on the Mount, but most Christian scholars believe that it was at the site that is known as Mount Eremos on the northwest side of the Sea of Galilee. A Byzantine Church from the 4th Century A.D. was built on the site, and its ruins are visible, as are the remains of a monastery which was built there. According to Matthew, the Sermon on the Mount was the first of Jesus's five discourses in which he sets out the moral principles of his teachings - many Christians see this sermon as Jesus's commentary on the 10 Commandments. Today, a Catholic Church, the Church of the Beatitudes, sits on the site and many Christian visitors come to experience the spiritual atmosphere of the sites. Bethsaida is the home of the Apostles Andrew and Philip and is also known as the "House of Fishing". It is located on the Northeast side of the Sea of Galilee. This is the site of the famous miracles where Jesus cured a blind man and fed the multitudes with loaves of bread and fish. Today, the Banias is a National Park with hiking trails and streams of water flowing through it. It is also the site of an ancient Greek city where the god Pan was worshiped, giving the site its name, Panias (known in Hebrew as "Banias). Christians believe that at this site, the northernmost location that Jesus traveled to, Peter identified Jesus as the messiah. Gennesaret is also called the Sea of Galilee and Lake Kinneret. Gennesaret is revered by Christians as the sea where many of Jesus's greatest miracles occurred. In addition, Jesus is believed to have appeared at Gennesaret after his resurrection to instruct his Apostle Peter to spread his ministry. Many Christian tourists spend a good amount of time at the lake, sailing it, walking around it, and visiting the various sites surrounding the lake where they believe Jesus walked. Jesus was baptized in the Jordan River, and it is a popular spot for Christians to visit. Many Christian visitors baptize, or rebaptize themselves at the river, usually at the southern edge of the Sea of Galilee, near Kibbutz Kinneret where the lake empties into the river.